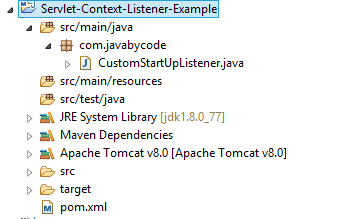 This tutorial shows you Java Servlet Listener-ServletContextListener example then you know how can listen to the startup of web application with ServletContextListener. You should know that ServletContextListener allows you to initialize application when it is deployed and free resources when the application is destroyed. This is seventh post of series of Java Servlet Tutorial. This series tutorial will provide you full knowledge about Servlet 3.0. To listen to the event on startup you should implement your servlet listener from the javax.servlet.ServletContextListener class and add the Servlet 3 @WebListener annotation to be enable application startup listener. The implementation requires to add two methods: public void contextInitialized(ServletContextEvent event) and public void contextDestroyed(ServletContextEvent event). These two methods help you to manipulate the initialization and destroy phases of web application. For demonization, we put file war into a web container (into the webapps directory of Tomcat 8 for example) then the contextInitialized() method is invoked such as the screen shoot. When we destroy our application then the contextDestroyed() method is invoked such as the screen shoot. That’s it on the tutorial Java Servlet Listener-ServletContextListener example and ultil now you know how to implement your own ServletContextListener. You can also find other servlet example in the series of Java Servlet Example.